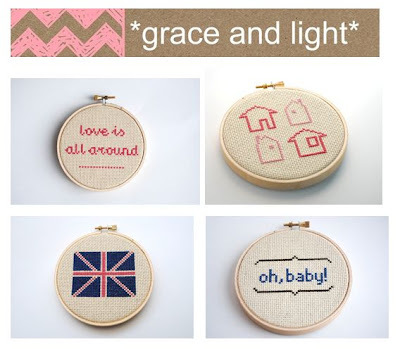 Our Spring Fling giveaway today is from Grace and Light. Don't you just love the name?It's such a happy name. Brooke, the owner is passionate about cross stitch (as you can tell from her darling shop). Her modern cross stitch designs scream fun! But that's not all you will find in her shop, she also carries an assortment of prints, bookplates and even makes custom orders. I'm thinking a Dianna + Travis cross stitch would be cute. I love the fun sayings done in cross stitch (oh baby, love is all around, Hooray) but I am dying for the Union Jack one. I can't get enough of Grace and Lights fun designs. I freaking looooooooooooove these!!!! How cute! I would totally do one for my babies room! What a talent. Love homemade works of art! They are so fun! Soo fun! :) I would love one of these! These are cute! I hope I win! So Cute. Pick me to win! I also check you out through Google Friend connect! This makes me a fan of crossstitch now ! super cute! I love needle point anything, but especially cross stitch. Yay!!! I like WDDW on FB! I follow every tweet on twitter. Cutest cross stitch I have seen!